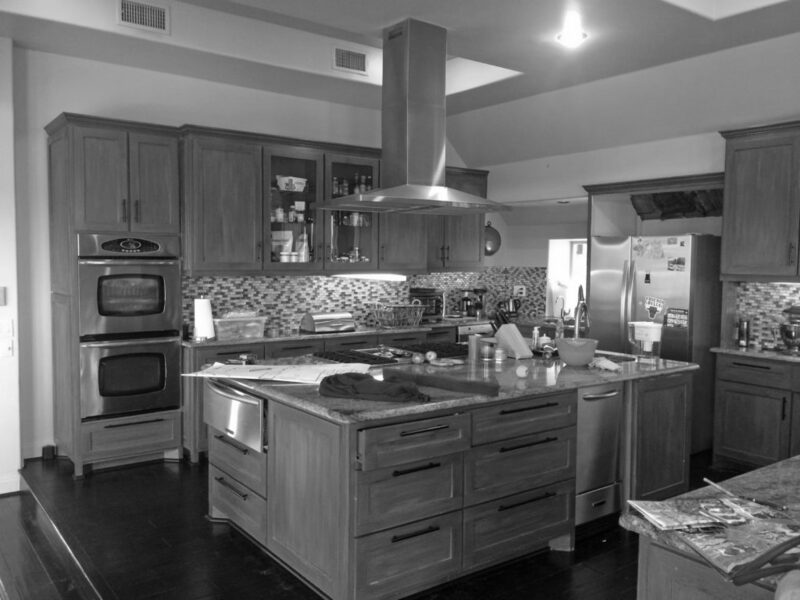 This kitchen had a myriad of issues that our team had to address – and quickly! Upon our initial interview with the homeowners the kitchen was already falling apart. The built-in refrigerator had gone out and the cooking appliances were failing. At one pre-construction visit the kitchen sink literally fell into the sink base. Furthermore, the kitchen was elevated by a couple of steps which created a narrow walkway between the breakfast nook and the kitchen. This not only made the flow awkward, but dangerous. Even though the kitchen area was quite large and seemingly open, jogs in the floor plan created bottlenecks and cumbersome working areas. The main kitchen sink and dishwasher were shoved into a tight corner which made it impossible to load the dishwasher while standing in front of the sink. The “pantry” was behind the kitchen, crammed into the void between the kitchen wall and slope of the roof plane on the outside wall. Due to the location of a dining room niche on the opposite side of the kitchen and having to deal with the room’s ceiling planes, many of the perimeter cabinets were extremely narrow in depth. 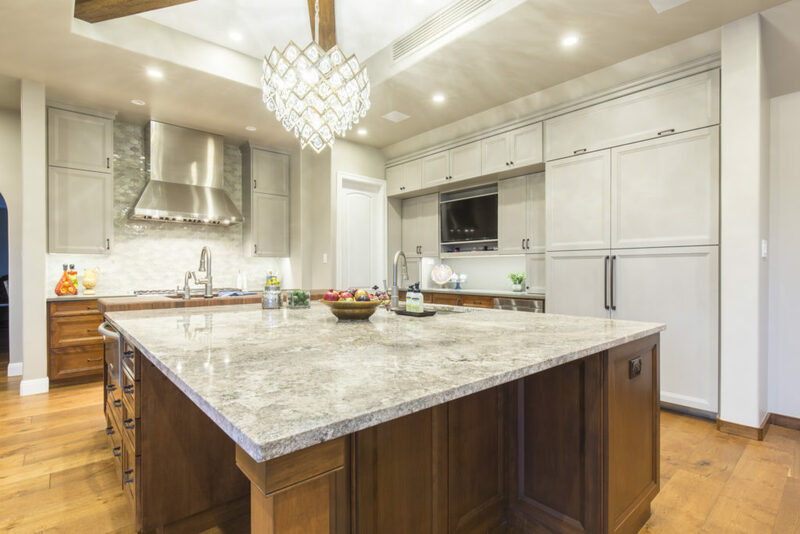 This led to having to store all the kitchen’s contents in an arrangement that wasn’t conducive to creating functional “zones” for cooking, prep, clean up or entertaining. The overall aesthetic was dingy and dated. The space lacked any focal points or interesting details. Any signs of craftsmanship, quality, or design elements were basically non-existent. The owners’ vision for the old laundry space was to incorporate a walk-in wine room, a fireplace, and storage for both functional and decorative items. The wine room needed to be the anchor for the overall design and the fireplace had to posses it’s own visual impact without competing with the wine room element. As for storage, the homeowner’s requested a place to store media equipment that was concealed from view and a place to access files, warranty manuals, games, DVDs and miscellaneous items. They also wanted open shelving to display personal treasures and decorative trinkets. The client wanted to completely gut and redo the downstairs, and all of it had to be reapportioned. Previously the downstairs housed 2 small guest bedrooms, a jack-n-jill bath, two awkwardly sized storage closets and a long, winding hallway; none of which suited the needs of the family. 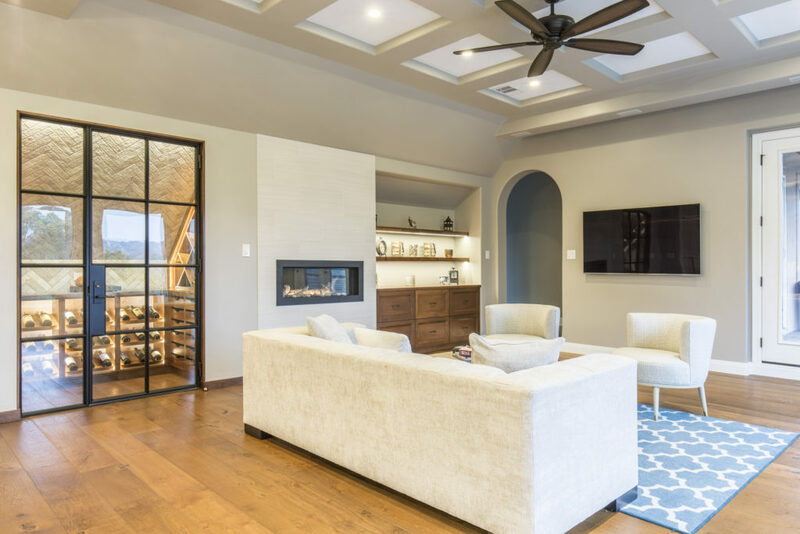 The goal was to reallocate the entire downstairs area to include a large game room and to have better access and view to the outside entertaining areas. Among other items requested by the family was a dedicated laundry room and a “flex” room that could be either a guestroom or home office with access to a central bathroom. The compact guest bathroom had a long list of criteria it had to meet in order to function for this family’s needs. This section of the house was an addition to the original house. Its layout was oddly divided and the homeowners did not require all the extra bedrooms or a multiple bathrooms. What they really needed was a dedicated laundry room, home office, game room (with direct access to the outdoor living areas) and a bathroom that would serve both the office and game room while also functioning as the pool bath. 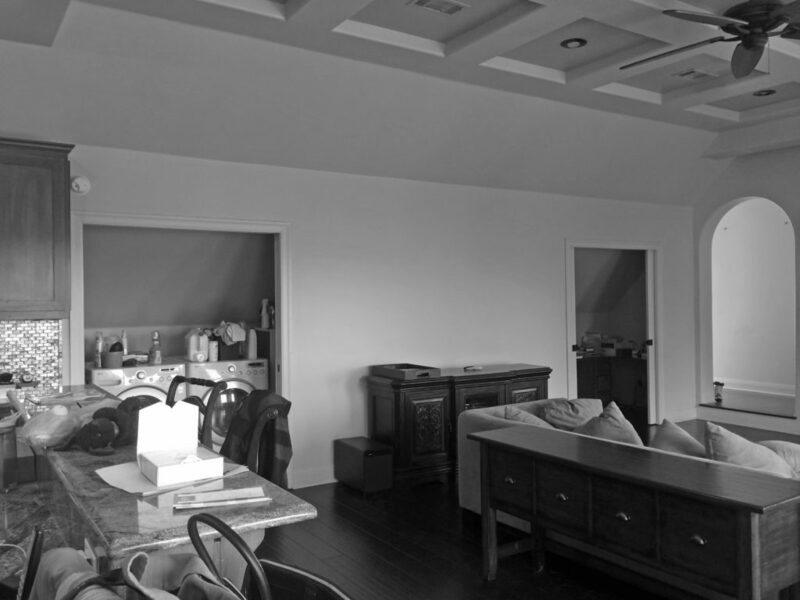 In order to accomplish the functionality of this bathroom, and the other rooms according to the owner’s wishes, our team would have to gut and reapportion the entire addition.